My daughter Shelby was diagnosed when she was five, with a genetic syndrome called Cornelia de Lange, and a secondary diagnosis of Autism. Shelby is considered to be high functioning but has separation anxiety and extreme anxiety along with behavioral issues. Watching Shelby live with anxiety can be heartbreaking at times because her fears are so overwhelming and confining. Even though anxiety consumes her at times, Shelby is living out her purpose and has had an impact on many. Her beauty reflects her warm and caring spirit. She loves to socialize with people but has always had a love and compassion for animals. In Shelby’s earlier years she wanted to be a veterinarian, even volunteering at a local pet groomer where she brushed and dried out the dogs. Recently, we heard about Healing Reins and the experience Stacy Denton and her board of directors have. After touring the facility and the mission of the board I was very interested in having Shelby continue reaching goals such as decreasing anxiety and increasing self confidence. Shelby is acclimating very nicely with her lessons at Healing Reins. One of the first visits Shelby was challenged to stand at “point” for a number of seconds to which I thought she would not attempt, but to my surprise, did. She has increased the number of seconds standing every lesson. I couldn’t be more proud of her progress. My favorite part of the program is allowing Shelby the responsibility of working with her horse and learning every aspect of what it takes to care for one. 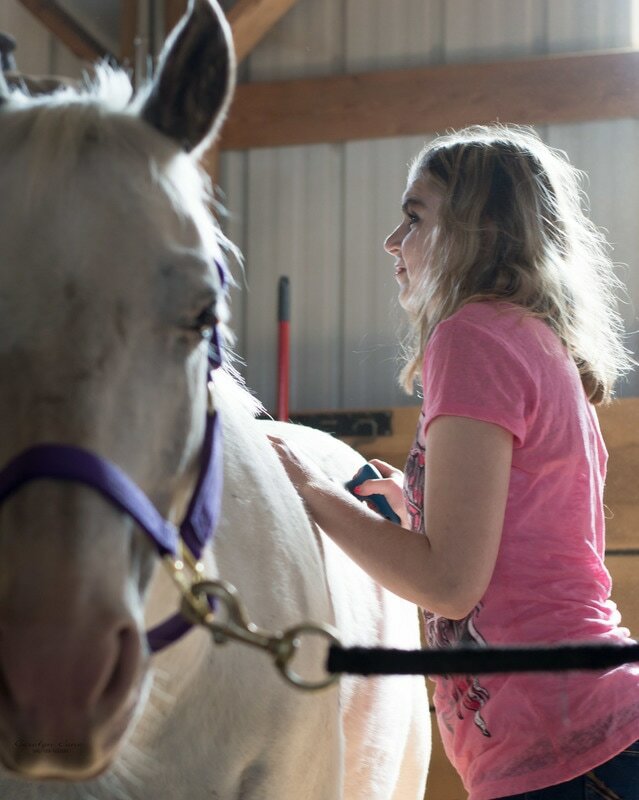 Through the steps of retrieving the horse from pasture, brushing the horse, saddling, riding, and unsaddling, brushing and turning back out to the fields, Shelby is learning to achieve goals at her own pace. This also encourages a bond and a mutual trust between both Shelby and her horse. At this point we couldn’t be happier. Stacy is very seasoned, professional and trained in both horsemanship and working with those who live with special needs and disabilities. Her patience equals her ability to challenge her riders to push through their fears and reach goals they otherwise wouldn’t.